From the Babies A Bloom series, this little cutie takes flight in her adorable outfit..
Small enough to hold in the palm of your hand, big enough to fill your heart with joy, we introduce you to "Butterpillar Blossom" , a 6 inch vinyl baby. She has brown eyes, and curly blonde hair, and is fully articulated for many fun loving poses. She is made from "Cuddle Me vinyl", an exlusive vinyl created by Marie to make cuddling this baby even more special. 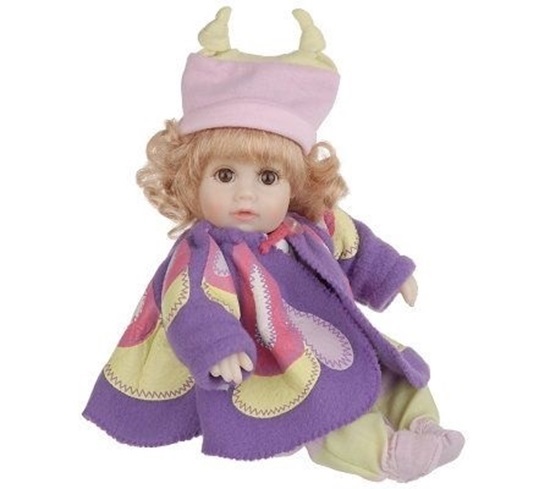 She is dressed in a pastel fleece dress with appliqued pieces resembling butterfly wings. A matching fleece fabric hat sits atop her head. As a mother of 8 and aunt to nearly 80 children, Marie Osmond called upon her expertise as a baby holder to create Babies a Bloom, a revolutionary new collectible, playable and holdable doll line.